The PCTV documentary “Shadow of Drought” won six awards in a clean sweep. Student work earned three additional Emmys, and three Palomar students were awarded scholarships. Pictured left to right, above: PCTV staff Luke Bisagna, Mona Urban, Bill Wisneski and Chris Garis at the Emmy Awards ceremony on Saturday, June 16. RANCHO MIRAGE, CA ― A Palomar College Television (PCTV) documentary won six Emmy Awards from the Pacific Southwest Chapter of the National Academy of Television Arts & Sciences on Saturday, June 16, in a ceremony that yielded a total of 10 Emmys for Palomar staff and students. 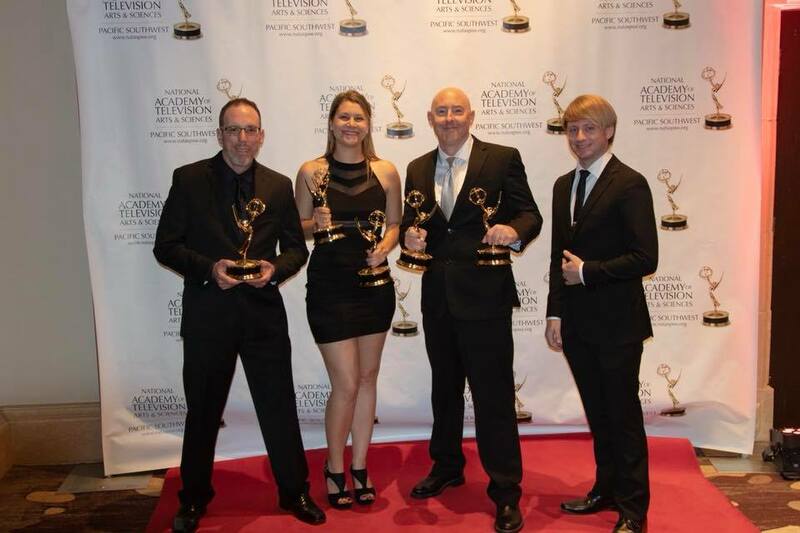 Two Palomar College students in the Digital Broadcast Arts (DBA) program also went home with Emmy Awards on Saturday. The DBA academic program produces North County News, Prep Sports Live, and Palomar Live from the PCTV facility. In addition to the awards, Palomar College students Angy Moran, Joseph Jauregui and Alberto Garcia were awarded scholarships by the National Academy of Television Arts and Sciences Pacific Southwest Chapter Foundation. The award-winning PCTV promotional piece can be viewed at www2.palomar.edu/pages/lit/. For more information about “Shadow of Drought,” visit www.droughtfilm.com.